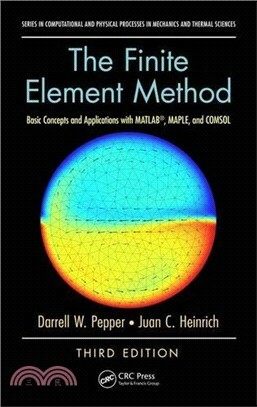 The third edition of the book introduces the fundamentals of the finite element method through simple examples and an applications-oriented approach using the latest computational tools. Using the transport equation for heat transfer as the foundation for the governing equations, text demonstrates the versatility of the method of weighted residuals for a wide range of applications including structural analysis and fluid flow. It introduces the boundary element method and meshless, or mesh-free, methods through two additonal chapters. User-friendly computer codes written in MATLAB, MAPLE and FORTRAN are listed. Dr. Pepper is presently Professor of Mechanical Engineering and Director of the Nevada Center for Advanced Computational Methods at the University of Nevada Las Vegas. He was appointed Distinguished Visiting Professor at the US Air Force Academy where he taught from 2011-2013. He served as an ASME Congressional Fellow in 2004, working for US Senator Dianne Feinstein in Washington, DC. He was Interim Dean of the UNLV College of Engineering in 2002 and served as Chairman of the Department of Mechanical Engineering from 1996-2002. He obtained his B.S.M.E. (1968), M.S.A.E. (1970), and Ph.D. (1973) degrees from the University of Missouri-Rolla (now MS&T). Following graduation, he worked for DuPont at the Savannah River Laboratory in Aiken, SC, where he held various technical and managerial positions. In 1987 he became Chief Scientist of the Marquardt Company, an aerospace propulsion company located in Van Nuys, CA. Dr. Pepper co-founded and was CEO of Advanced Projects Research, Inc., an R&D company involved with development and application of computational methods in fluid dynamics, heat transfer, and environmental transport. He has published over 300 technical papers on fluid dynamics, heat transfer, and environmental transport topics, and authored/co-authored six books on advanced numerical modeling and one on indoor air dispersion. He is a Life Fellow of the American Society of Mechanical Engineers, Associate Fellow of the American Institute of Aeronautics and Astronautics, and a Fellow of Wessex Institute. Dr. Pepper is currently an editor of the J. of Thermodynamics, Associate Editor of Computational Thermal Sciences, was Associate Editor of the ASME J. of Heat Transfer from 2010-2013, and was Associate Editor of the AIAA J. Thermophysics and Heat Transfer from 1990-1997. In 2008, Dr. Pepper was awarded the Eric Reissner Medal for his work in computational methods. In 2010, he received the Harry Reid Silver State Research Medal. In 2011, he received the AIAA Distinguished Service Award and in 2012 the AIAA Energy Systems Award. Dr. Heinrich is Emeritus Professor of Mechanical Engineering in the Department of Mechanical Engineering at the University of New Mexico. He served as Chair of the Department from 2004-2012. Dr. Heinrich previously was a member of the faculty in the Department of Mechanical and Aerospace Engineering at the University of Arizona. He received his undergraduate degree from Universidad Catolica de Chile and his Ph.D. in Mathematics/Numerical Analysis from the University of Pittsburgh. He is a Fellow of the ASME and member of the ASEE, and acts as a consultant to several international institutions. He is currently editor, advisor and reviewer for a variety of technical journals, including Computer Methods in Applied Mechanics and Engineering and Progress in Computational Fluid Dynamics. He has been a consultant for several major corporations and published over 100 technical papers in the area of finite element analysis. He is co-author of the book Intermediate Finite Element Method. Fluid Flow and Heat Transfer Applications with D.W. Pepper.